I mentioned in a previous post that I’m a pretty regular customer at Garibaldi, considered by many foodies in Singapore to be our best Italian restaurant. I’ve been going there consistently since it opened and, for a good year or so, I had lunch there with colleagues and clients at least once or twice a week. It was near my old office, was both quiet and chic at the same time and served an excellent, reasonably priced set lunch. I also went with friends and family at night, which while a costlier affair was also more decadent. We would often put ourselves into the hands of (then-owner and) manager Beppe De Vito and chef Roberto Galetti. And we would always be rewarded with an outstanding, multi-course feast paired with luscious Italian wines. Of all of Chef Roberto’s very well-executed dishes, I have three clear favorites. His spinach gnocchi served with a gorgonzola sauce, walnuts and aged Balsamic vinegar is smooth, sensual and rich. It’s like Catherine Deneuve on a plate. My second favorite is his osso buco with saffron risotto. Chef Roberto’s osso buco (braised veal shank) is the best I’ve had in a restaurant in Singapore. It’s soft, succulent, hearty and very, very savory. His risotto is equally delicious. 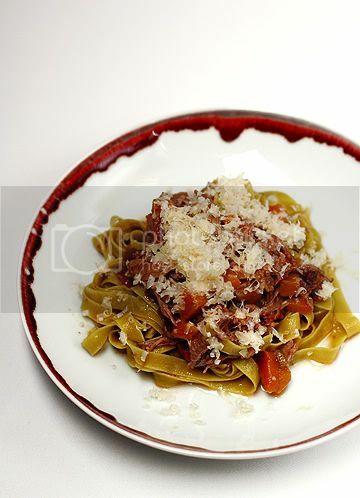 But the dish that I like above all others is Chef Roberto’s Bigola Di Spinaci Al Brasato D’Anatra, i.e. homemade spinach noodles with a braised duck sauce. I really love this dish. So does my darling wife S. She likes it so much, in fact, that she once ordered it as a starter and then, after she finished her main course, promptly ordered an additional serving in place of dessert. I have to admit that I’m often tempted to do the same thing. The duck ragout is made from duck legs and aromatic vegetables that have been slowly braised in stock and red wine. The sauce is powerful and comforting, something like the the culinary equivalent of a full-grown Golden Retriever cuddled up on your lap. After a lot of pestering, Chef Roberto has finally given me the recipe for this fantastic, signature dish. I tried it out for the first time this past weekend. Because I was a tad lazy and short of time, I didn’t bother making my own pasta. The sauce was excellent and surprisingly easy to make. My version turned out quite a bit lighter than what I usually get when ordering this at Garibaldi. I have the feeling that Chef Roberto adapted the recipe a bit, making it healthier, before giving it to me. The restaurant version tastes like there’s much more tomato and/or tomato paste in it. It’s much stickier and stronger in taste. The restaurant version also tastes like Chef Roberto uses a rich, meat stock instead of the vegetable stock that he recommends in the recipe. That said, a friend who has had this dish several times in the restaurant and whom I also fed this past weekend said she actually preferred the slightly lighter version. It meant, she suggested, that she could eat much more of it without feeling too guilty or getting too full. I highly recommend trying it both in the restaurant (for those of you in Singapore) and also at home. In a big pot, sauté the vegetables with olive oil. Meanwhile flour the duck legs and then pan-fry them until golden. Put the duck legs into the pot together with the vegetables. Then add the wine, the bay leaves, and the peeled tomato. Crush the tomatoes into the pot with your hands. Pour in the vegetable stock and bring everything to a boil. As soon as it boils, lower the heat, cover and simmer for 2 hours. After 2 hours, separate the meat from the sauce. Remove excess fat and skin. Then debone the duck legs, mixing the meat back into the vegetables and sauce. Leave to rest. Cook your noodles. Then reheat a portion of the sauce in a pan with butter, black pepper, and salt. Add some of the boiled/cooked noodles and toss. Sprinkle Parmesan cheese and parsley over the pasta and serve immediately. Looks great! Could he have used plum tomatoes maybe? This looks so mouthwateringly delicous and I LOVE the plate. yum. you make it sound so simple…. and becuase of this i will try it at home. most of the duck ragout recipes ive come across asks to use a whole duck which has put me off as the task seems so complicated…. but with duck legs… im all for it! We used Roma/plum tomatoes in the ragout. Oh my.. I love duck, and the recipe doesn’t look quite difficult, maybe I should try it. Btw, can I use other parts of the duck? I guess it’s not easy just to buy the legs from the market or even the supermarket. Thanks for a delicious recipe. When I think duck legs, I usually think confit, but this recipe is good reason to think otherwise. I have to admit the use of vegetable stock seems odd. I think when I make this I’m going to use some of the game bird stock available at my local butcher. Mae: Yah, I’ve been reading about all the duck you’ve been eatings. Sounds fab. Tokyoastrogirl: Thanks. The plate’s from a Shanghainese ceramics company called Spin. I love it too. Deborah: It’s great that Roberto only uses duck legs. That ensures that all the meat is really tender and flavorful. Zara’s Mom: We get frozen, French duck legs from Culina. Supposedly, Carrefour also occasionally stocks these. Rob: Good idea. I’m thinking of a brown veal stock next time around. I happened to have frozen French duck legs from Culina. I suspect that the rest of the duck might get really stringy when cooked for such a long time. When buying a whole bird, I often save the duck breast for a different preparation and use just duck legs for braised dishes. I’ve also been told that Carrefour occasionally sells just duck legs. Two duck legs yielded enough pasta for 4 people. Sounds delish. I’ll have to try it. I usually buy a whole duck from the market, use the duck legs for things like this and then save the breast to make Kylie Kwong’s Crispy Duck with Blood Plum Sauce. That’s one of my favourite duck dishes. looks fantastic and i can just imagine the savoury flavours in front of me right now. such a simple recipe that i’ll have no excuse not to do it myself. luckily the end of eat local is just around the corner! Thanks so much for posting this recipe! Just one question: Does this sauce freeze well? Eggy: Ooh, I love Kylie’s crispy duck. Haven’t tried making it yet. Any chance I can armtwist you into making me some? Melissa: I wouldn’t mind trading some of our hot, wet, sticky summer days for a few of your chilly Scottish summer days. 🙂 Glad the recipe appeals, not that I can really take credit for it. ML: I am going to guess that it probably does. Most braises do, so I don’t see why this wouldn’t. i’ve been missing a lot! you’ve got a bunch of great posts not to mention great shots here! what with your gear! i’m so envious! i want one too! and i’m linking you in ok? I’m always impressed at the clean and clear way you write out the directions. This one’s going into the “must-try” pile – thanks. I’ve never thought to team duck and pasta. Your photo certainly made it look delicious though. I will have to give it a try, and hunt down some squid ink spaghetti. I LOVE duck! Whether it be duck confit or roasted Chinese duck, it is some of the best poultry out there!! Thanks for the recipe too! I’m not sure when I’ll have time to make it, but it’s some great inspiration. Hope you can come by my site sometime. Love your photos! This looks good. I love duck & I love pasta! Thanks for the recipe. Unfortunately, when I tried a similar dish at Halia. It was awful. Somehow, the flavours did not gel & the sauce was too acidic. I will try the recipe & hope to have a better result than what I ate at Halia. Simply terrific. As a restaurant owner this was as good as my former chef’s. try it with cavatelli. Plan to try out the recipe very soon – but don’t like celery! Wondering if you can suggest a substitute for it? Or do uou think I could just leave it out? Hi Su, There is no obvious taste of celery in this dish. But you can always just omit it if you like. Perhaps you could substitute it with a little more onions and carrots. Tried this dish yesterday. A few minor mishaps but it turned out good. My first mistake was being too lazy to cut the veggies, I blended it too much in my electric blender and it came out looking like baby food. Then I decided to only use one pot so I browned the duck first and forgot to dust it with flour. O well. So I pulled out the duck (at this point the skin is all charred up but no problem, still ok!). Cleaned the pot up a bit and sauteed the baby food in the pan. I used beef stock instead. I had to strain the veges out in the end because it started to look like poopie in diapers. Overall I think the duck flavor is very bold but still quite tasty. Also, the sauce was very acidic but it was tempered with the butter and cheese. At the end, it was not too bad. My guinea pig taste testing friend said he’d eat it again. 🙂 Thanks for the recipe. Thank you for the feedback! I’ve also tweaked the ingredient porportions a little (you will find a mention of this in our post on making bigoli, the pasta that is meant to go with this sauce). Choosing a softer red wine to cook with could help temper the acidity. I also prefer veal or beef stock as you have opted to. I will have to berate you for not julienning the vegetables. They actually retain their shape and give an added texture to the dish. 🙂 Straining the veges out might also have affected the flavour of the finished dish, extracting some of the sweetness along with it. I hope you’ll try it out again. Using a Japanese mandoline (an inexpensive addition to the kitchen) could take all the agony of hand julienning the veges. Glad your guinea pig said that he’d eat it again. Hi there, how many servings does this make?